Organic. 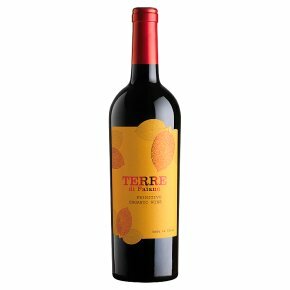 Wine of Italy.Terri di Faiano is a delicious and full bodied red wine produced with the best Organic Primitivo grapes grown in the southern Italian region of Puglia. It is a wine with a lovely and intense ruby-red colour, aromas of rich dark fruit, a silky texture and big bright spicy flavours of dark cherries, vanilla and chocolate. All the flavours you want and all completely natural. Grazie Madre Natura!